Defending champion Geoffrey Mutai and his compatriot Priscah Jeptoo won the men’s and women’s races at the New York City Marathon today to ensure a Kenyan clean sweep of the event. Mutai, who set a course record in 2011, successfully defended his title from that year – the 2012 edition was cancelled because of Hurricane Sandy – in 2 hours 08min 24sec after he broke away from the field with about four miles to go to the finish line. 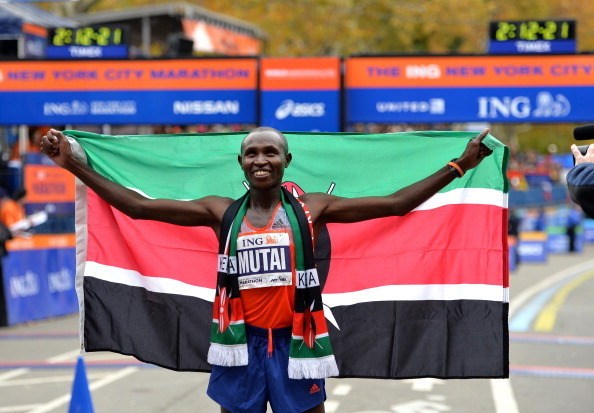 Defending champion Geoffrey Mutai won the men's race at the New York City Marathon on Nov. 3. Mutai finished 52 seconds ahead of Ethiopia’s Tsegaye Kebede, who seemed happy enough to be settling for second place. Lusapho April of South Africa finished third, clocking 2:09:45. The women’s race saw this year’s London Marathon winner and London 2012 silver medallist, Jeptoo, take the New York crown in 2:25:07 after she caught Ethiopia’s Bizunesh Deba with about two miles to go. “This is a great moment for me, and this is a day I will not forget for the rest of my life,” Jeptoo said. Deba finished 49 seconds later, followed by two-time New York Marathon winner Jeļena Prokopčuka of Latvia in third with a time of 2:27:47. Contact the writer of this story at emily.goddard@insidethegames.biz. Inside the Games is an online blog of the London Organizing Committee that staged the 2012 London Games. The blog continues to cover issues that are important to the Olympic Movement. This article is reprinted here with permission of the blog editors.